ASSO Micro Finish - 140 yds. Select LB. *: First, Select Select LB. 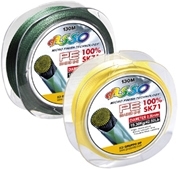 • maximum durability It is particularly suited for lure ﬁshing and for surfcasting. ASSO Power Braid - Black - 140 yds. ASSO Camouflage - 140 yds. ASSO PE Sinking - 110 yds.